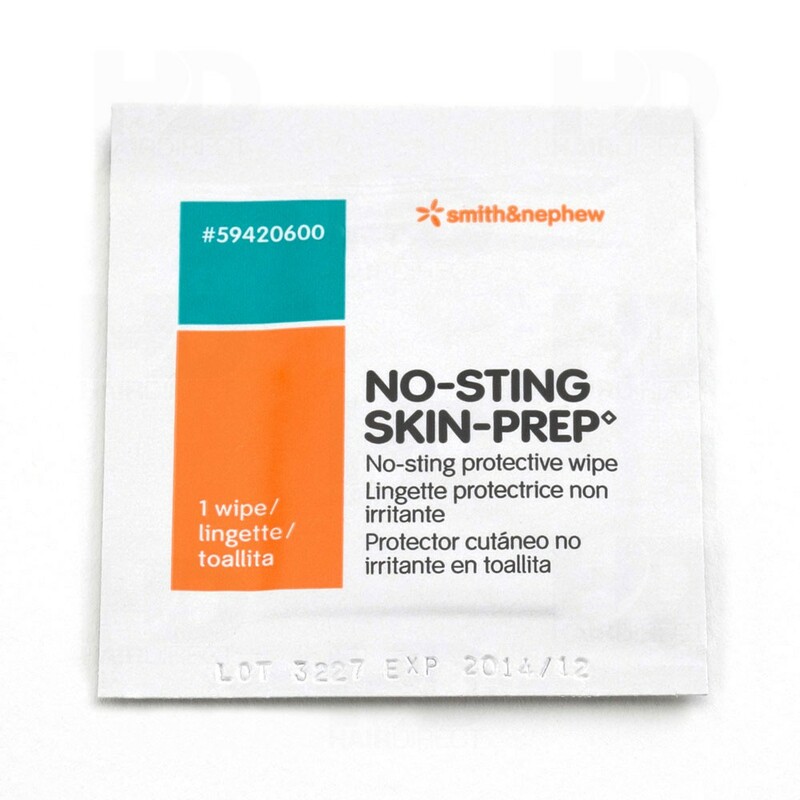 No Sting Skin Prep is a latex-free liquid film protectant. A liquid film can easily cover problem areas like elbows. 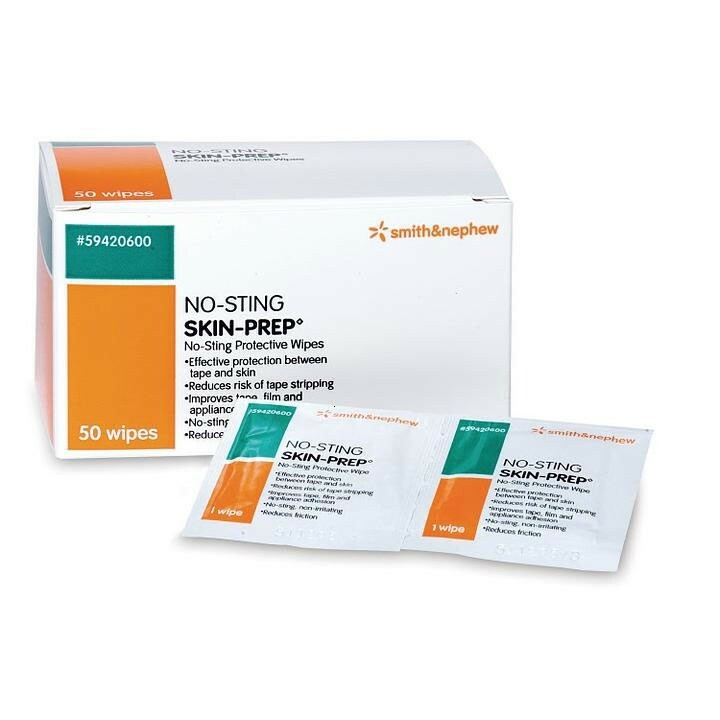 This no sting protectant is designed to eliminate skin irritation from dermatitis related moisture, incontinence, friction, and adhesive trauma. It can be applied on healthy or damaged skin with ease and its lack of alcohol eliminates any stinging. This film protectant is breathable to promote a better healing environment for the skin. It also has a fast drying design to reduce time before being able to perform the necessary procedures and lasts up to 4 days. It is waterproof too! Being waterproof permits normal washing around the area without fear of removing the protectant. Also, the protectant extends the life of dressings applied over it, reducing the frequency of dressing changes. No Sting Skin Prep is also hypoallergenic making it safe for most people. Also, this protectant is available in a wipe or a swab depending on your preference. Removing the liquid film protectant is simple with an adhesive remover such as the Remove Adhesive Wipes. Undoubtedly the BEST no sting skin prep on the market. Also dealing with Vitality Medical is always a pleasure. Great service!! I have ordered this no sting many times and they have done a great job in taking care of me in doing so.They even send out a notice telling when I should think about needing it again. with a discount if I order it then. Great Co. It was a great help for my stoma. Really easy to apply. On top of that, since it has no alcohol, no worries for irritation! As being one with quite sensitive skin, I can say it's the least skin-irritating material. What's more, even after removing it, you can't see anything remaining sticky on your skin. When I went to visit my mother this weekend, I noticed that she was using No Sting Skin Prep to protect her damaged skin from any friction or incontinence. It is really good to see that she was very much comfortable with that dressing on. The product is easy to remove without leaving any unsanitary residue around the wound. All you need is a skin cleanser and water to remove it.